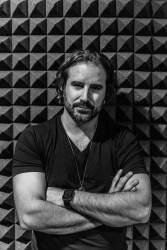 David Messier is a songwriter, multi-instrumentalist, artist, record producer and owner of Same Sky Productions, Inc., one of Austin's most innovative recording studios. David currently serves as a Trustee of the Recording Academy (GRAMMYs). David served as President of the Texas Chapter of the Recording Academy from 2016-2018, and prior to that, as a Governor of the Academy, he started the Texas Chapter's Philanthropy Committee, which raised and awarded over $30K in college scholarships. From 2001-2007 Messier was the front man of the Boston-based band Papermoon which released 3 albums, most notably working with producer/engineer Paul Santo (Ringo Starr, Aerosmith). In 2009 David relocated Same Sky (and himself) to Austin, TX. In 2011 the Austin American Statesman named David one of the Austin Music 500 and he was featured in the "FED EX & Me" program highlighting creative companies with young presidents. In February 2016 David released "Waiting For Eldridge" (his first solo album) on Fable Records to critical acclaim. David is a leader, volunteer, sponsor and patron of the Austin community, including the SIMS Foundation, HAAM, HOPE Outdoor Gallery, ADL, Austin PRIDE, Grounded in Music, GRAMMY U, and Dart Music International. Austin Mayor Steve Adler declared June 8, 2017 "David Messier Day" in recognition of his musical accomplishments and contributions to the local industry. In May of 2018 David was awarded the prestigious "Austin Under 40 Award" in the category of "Arts and Entertainment." In the fall of 2018, David will release his much anticipated follow-up solo album titled "Time Bomb."